This happened when astronomers used the Hubble Space Telescope to photograph the globular star cluster NGC 6752 (located 13,000 light-years away in our Milky Way's halo). In a celestial game of "Where's Waldo?" 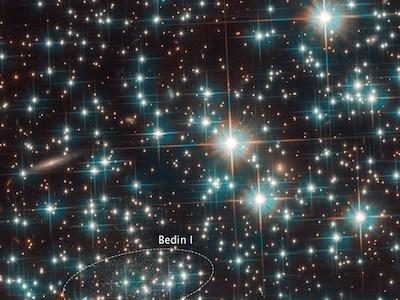 Hubble's sharp vision uncovered a never-before-seen dwarf galaxy located far behind the cluster's crowded stellar population. The loner galaxy is in our own cosmic backyard, only 30 million light-years away (approximately 2,300 times farther than the foreground cluster). The science team's results will be published online January 31, 2019, in the Monthly Notices of the Royal Astronomical Society: Letters.